MET eCell celebrated eWeek in collaboration with NEN (National Entrepreneur Networking) all over India from 6th to 13 February, 2010. The theme for this year’s event was ‘India: Opportunities Within’. 4th and 5th Feb: Ground Zero Activity: “Apprentice” – An intra class event to identify the opportunities within India - was organized to set the ball rolling for the upcoming week. Teams (4 members each) were given a situation (a problem India is facing) and they had to come up with innovative solutions. Other team had to counterattack the same and so on. 6th Feb.: Marked the inauguration of the same– Brig. M K Nag, Director – MET AMDC and other distinguished faculty members. 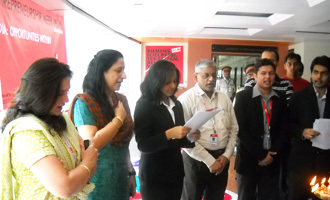 The pledge of the eCell was taken by all the members present during the ceremony. Mr. Vinay Shetty, Vice President - Think Foundation, gave a small session on Thalassemia Awareness – critical need of hour for our country. Teams from all divisions across Institute of Management participated and the event was a huge success with the profits earned of more than Rs. 10000/- collectively. The profits were given to students as a part of their rewards. The next day: 7th Feb: MET has its own entrepreneurs who have lead a path of difference and have identified the opportunities in country. Mr. Milind Agrawal, Founder of smsgupshup.com. He enthralled the audience by his encouraging speech on the theme India: Opportunities Within. He mentioned that for every problem that India is facing, it’s an opportunity for every entrepreneur to convert it into the solution and a business! Mr. Rohan Mehra (alumnus) is event organizer and freelance voiceover artist. He came to address the budding entrepreneurs and to guide them about how they can also choose their dreams over a job and convert them into reality. Mr. Avnish Tiwari (alumnus) is owner of a theme restaurant at Jaipur, Rajasthan. He had a dream and now a reality. He mentioned that until you are happy with what you are doing, you cannot achieve success. 10th Feb: Seminar by Founder of Talwalkars: Madhukar Talwalkar. He spoke on his journey of success and the future plans of expansion. 11th Feb: Event named” Face-Off”. First time in MET students of 2 Institutes came together for an event. Students of IOM were given a business plan and they were made to represent a company. Students of Mass Media were the press. A mock (simulation) press conference was organized and the teams were answerable to the media questions. It gave the budding entrepreneurs the sense of feel of press conference that are organized by companies during launch or expansions of their products. It was an interactive session. Students were allowed to ask questions and madam answered all the queries for all students who had innovative ideas to enter into business world. She also gave students the opportunity to place their ideas on the portal whereby they will be provided necessary support to start with their entrepreneurial venture. Trustee – MET addressed the students and gave them the thought that starting your own business is not the only venture. Students can also expand the existing businesses with their innovations and ideas. He congratulated the eCell team for the successful completion of the eWeek. Page sir congratulated students for participation in huge numbers and successful completion of event. Winners were given cash prizes and certificates. Apprentice was intra class event. All 7 classes of IOM participated. Winners from each class were qualified for round 2. Round 3: Face-off. Each of these 3 teams were made to represent a company. The final winners were given the prize money and certificates.